1) Notice that it's got a plantigrade foot. Andrea Cau turned me on to an interesting paper (via his excellent post) that suggests, based on alleged therizinosaur footprints, that these big theropods had bear feet. It's certainly more plausible than the "knuckle-walking" strategy I suggested like two years ago on this humble blog. 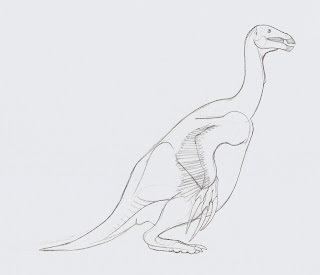 However, I do still endorse a chalicothere model, so this therizinosaur is comfortably sitting on his haunches. 2) If that center claw is three feet long, then the whole animal is between thirty and forty feet long. I've never been comfortable with uber-huge estimates for Therizinosaurus. The largest maniraptor known from good material s Gigantoraptor, and it's almost thirty feet long. What I've done to combat oversizing the animal is to shorten the neck and tail. If we're talking about an animal the size of Allosaurus, it can probably reach its leafy greens just fine without a sauropod-sized neck, thankyouverymuch. 3) Only the arms have feathers (right now), and even those may largely disappear. Giant animals with insulating feathers? Probably not. I may give it very sparse feathers along the back, flanks, and arms. in Beipiaosaurus there are not pinnaceous remiges feathers (as seen in Caudipteryx, birds and dromaeosaurs) but simpler filamentous "protofeathers" and the bizarre elongate structures described last year, so, it seems more plausible not to depict Therizinosaurus with arm remiges. In my opinion, Therizinosaurus weighted no more than a modern adult Giraffa: why not assuming it was fully and densely covered by short filaments instead of almost naked? Looking forward to seeing were this is going, Zack! Excellent so far. I'm guessing that the arrangement of the three therizinosaurs will be gold, silver, and bronze? On the podium? Looks good! But I think the head might be a tad large. Good point about the feathers, Andrea. Totally forgot about that. Absence of an outlever for the gastrocnemius and pedal muscles on the extensor surface of the pes makes it unlikely the animal had the propulsive or leverage capable of walking in this position. Moreover, even though bears CAN walk in this position, they transition to a gait where the ankle rests on the ground in brief transition and essentially while in four-limbed movement, and have a heal that protects the ventral pedal tendons. Broad pedal phalanges indicate they board much of the weight of the foot, even though the pes is also short and broad, and this simply implies that the ankle had limited contact with the ground during the propulsive phase of the step cycle (in which thye heel of your model would be on the ground). In addition, the morphology of the metacarpo-phalangeal bones of the manus make the flexure proposed of chalicotheres unlikely--they simply could not flex to that degree at the crucial joint.